Toyota officially brought the 1KZ series into the 21st century in 2001 with the 1KD series turbo diesels. 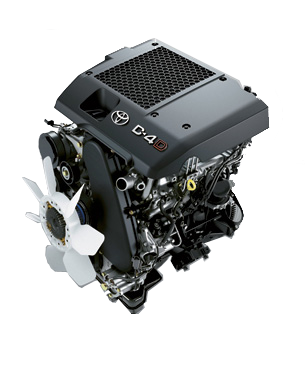 The 1KD features dual overhead camshafts, direct injection, and Toyota’s proprietary common rail high pressure fuel system termed “D-4D”. Simply put, the 1KD’s are amazing. Incredibly quiet with a serious torque band from 1,800-3,600 rpm.The first generation 1KD was released in 2001 and found it’s way into the early Landcruiser Prado. In 2005, Toyota updated the 1KD engines to the 1KD-FTV which featured a 32-bit ECU, a variable-nozzle turbocharger, and piezo-electric, multi-stage injectors with pilot injection. These additions raised the base power from 145 hp to 188 hp and increased torque from 220 ft/lbs to 310ft/lbs. The pilot injection dramatically reduced engine noise, emissions, and torque throughout the engine’s range. While Toyota never officially released the 1KD-FTV in North America reportedly due to newly adopted emissions standards in California, it has received several awards for the 1KD-FTV including achieving strict emissions compliance in Europe. Im ready to get started, whats involved? To start the conversion process, email us with your vehicle’s specifics. We will need the year, model, transmission type, and whether or not the vehicle is 2WD or 4WD. Once we receive this information, we can put together an itemized quote for your project. Where do I get parts for my conversion once its finished? We provide all of our customers with a Diesel Toys New Customer Packet on a USB drive. This drive contains the Toyota factory service manual, and all applicable fluid capacities, break in procedure, service procedures for the vehicle, and contact information for our parts sources overseas. How do I service my converted vehicle? We recommend finding a local diesel technician that specializes in TDI Volkswagens. These TDI specialists are typically more familiar with modern 4-cylinder diesels than your domestic diesels. If you cant find one or need a recommendation, hop on TDICLUB.com and look for their Trusted TDI Mechanics List by state. We take the cost of the power-train+ components required for the conversion + the nationwide average shop rate of $100/hr and we end up with the total for the conversion project. The typical diesel conversion has 100-120 hours of labor factored into the price. So, that translates into $10,000-$12,000 in billable labor hours. Can I supply my own diesel engine? Due to the high probability for an issue to arise, we decided to just leap-frog this entirely and not even go there. Our business model revolves around a professional installation. If there is an issue, we work with our suppliers to rectify the issue on our dime, not the customer’s. Do you repair things during the process? Through the years, we have had vehicles show up with serious mechanical issues. Sometimes, the owners “assume” that we are rebuilding the entire vehicle so they “forget” to tell us the fact that the vehicle was totaled, or there was an engine fire etc. The diesel conversion process does NOT include rebuilding items on the vehicle and all pricing is based off a running driving vehicle in good order.